Yes, the south of Scotland, too, has some marvellous rivers.... the Tweed one of the top Scottish salmon fishing rivers; the Clyde, hard to beat for trout and grayling fishing; the Nith, Annan and Border Esk, often overlooked by those in a hurry to reach the highlands, but each offering some of the most attractive, and productive, fly fishing beats and most of them very accessible to the visiting angler. The map below shows the main salmon rivers in southern Scotland. 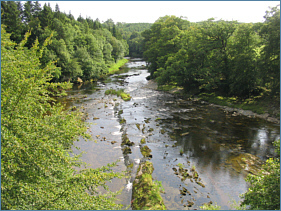 The famous River Tweed flows eastward to enter the North Sea at Berwick; the Nith, Annan and Esk southwards into the Solway Firth; while the Stinchar, Doon and Ayr flow west through Ayrshire to the Firth of Clyde. Clicking on a blue dot will take you to a page showing detailed maps of each salmon river with additional information on the salmon fishing available on the rivers in the south of Scotland. For more information on the wonderful salmon fishing on the southern Scottish rivers, including detailed maps, please select a salmon river by clicking on a blue dot on the map or on a river name in the list to the right of the map.